When Apple first showed off Touch ID on the iPhone 5s, everyone knew what it would eventually lead to: using your fingerprint to access anything secure on your iPhone, in any app. At WWDC last month, Apple finally announced that it was opening up the feature to all app developers. 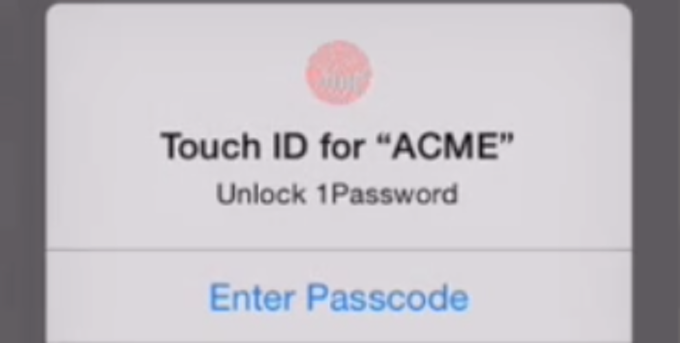 Now, AgileBits is showing how its 1Password app will combine Touch ID with iOS 8’s Extensions to let you securely log in to any app without having to save your credentials everywhere. In a quick video on its blog, the company demonstrates how users will be able to use 1Password to quickly sign in to an app protected by one of its long, hard-to-crack passwords. From the login screen, the 1Password Login extension can be reached with a quick swipe up to open Control Center. You press your thumb to Touch ID, and the extension automatically brings up the different accounts you’ve saved for that app. With another tap, the credentials are entered and you can sign in. That’s a lot safer than simply staying logged in to all your apps. For apps that you don’t obsessively check and want to keep secure or private, the 1Password Login extension will be a nice compromise between speed and ease of use. AgileBits is hoping to get developers to integrate the extension in their apps by the time iOS 8 launches this fall, and has created a GitHub page with documentation and examples in order to make the process easier.